There are 1,440 minutes in a day, and new research findings suggest that you only need one of those minutes to start improving your bone health. As you age, your bones become weaker and the risk of fractures and breaks significantly increases. Breaking a bone in old age can have detrimental effects on your health, including reducing your independence and contributing to other health problems like bed sores or blood clots. It is estimated that 54 million Americans are living with osteoporosis—a bone disease that occurs when old bone is not replaced quickly enough with new bone, causing small holes to form. This increases the risk of breaks and fractures. It is estimated that one in two women and one in four men over the age of 50 will break a bone as a result of osteoporosis. 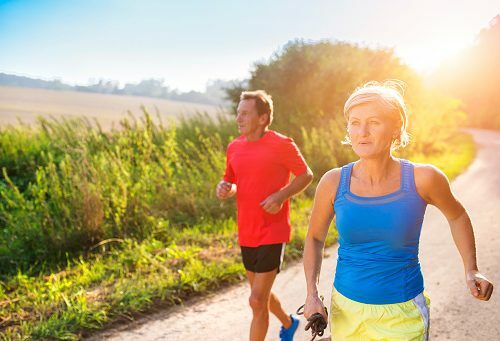 Calcium and vitamin D are essential parts of maintaining strong bones, but the latest findings suggest that going for a one-minute run daily can go a long way in supporting healthy bones too. The findings came from researchers at the University of Leicester, and they revealed that one-minute of high-intensity, weight-bearing physical activity is associated with improved bone health among women. It is recommended that people partake in a minimum of 150 minutes of physical activity a week, but these guidelines are not specific for improving bone health. The latest findings examined whether or not physical activity relevant to bone health was associated with improved bone health in pre- and post-menopausal women. The researchers reviewed data from over 2,500 women and measured their activity levels by having the women wear trackers. Bone health was measured by ultrasound on the women’s heel bones. It was found that women who partook in 60 to 120 seconds of high-intensity, weight-bearing activity had four percent greater bone health than women who only conducted less than a minute of physical activity. Women who took part in over two minutes of high-intensity, weight-bearing exercise improved their bone healthy by six percent. The study proves that even a small burst of physical activity is enough to improve bone health, which is an easy option for those of us who don’t have the time to exercise.